If you’re in the market for a smartphone handset these days, you have two choices when it comes to operating systems – Apple’s iOS, or Google’s Android OS. Well, that’s about to change. A new OS will be coming to the marketplace soon when Mozilla introduces its new Firefox OS for mobile devices. As Mobile World Congress kicked off in Barcelona, Spain yesterday, the Mozilla Foundation announced the preview of its new Firefox operating system and Firefox Marketplace with partners that include 17 mobile carriers. 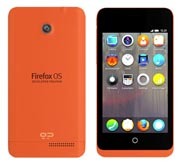 The first devices running Firefox OS will be manufactured by Alcatel, LG, and ZTE, and will be debuted only in emerging markets. The devices are scheduled to roll out later this year, and are based on Qualcomm’s Snapdragon mobile processor. They won’t be in the United States for a while – the first wave will be destined for customers in Brazil, Colombia, Hungary, Mexico, Montenegro, Poland, Serbia, Spain, and Venezuela. Mozilla is counting that its superior search capabilities and integration with social networks like Facebook and Twitter out of the box will make it very competitive with both iOS and Android. The operating system is designed to have almost everything a user will need right from the beginning – support for calls, messaging, email, and photographs. It will also offer built-in cost controls and usage tracking, as well as support for location-based services, and the Firefox web browser. “Every device is better if it’s social, and we’re excited that Firefox OS users will have easy access to the mobile web-based version of Facebook that will take advantage of our current and future features,” explained Vaughan Smith, the Vice President for mobile partnerships at Facebook. The countries that Firefox is targeting for the OS release are a smart move. They are typically places that don’t have deep penetration or fast adoption rates for Apple’s iOS or Android yet.